Cellcard one of the leading mobile operator in the Kingdom, yesterday said it is ready to upgrade its mobile infrastructure to 5G, adding that it is targeting a commercial launch of the services in the second quarter of 2019. 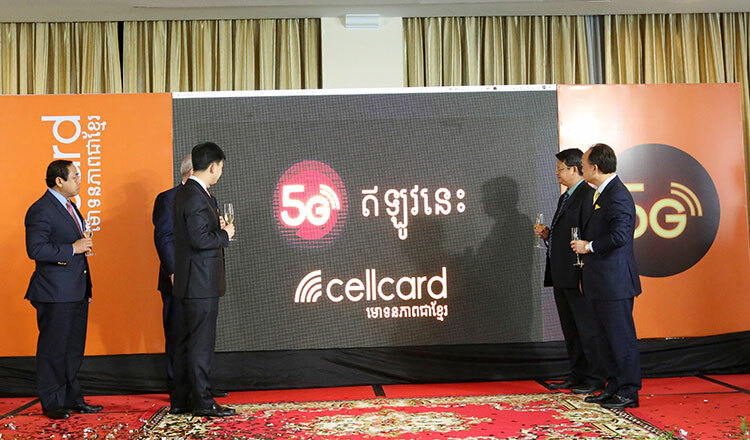 Cellcard’s CEO Ian Watson said during the Cellcard Journey to 5G event, the company will introduce the new technology in Cambodia through together with a digital platform that will enhance people’s life, build cleaner and safer environment and continually support all Cambodians by being a true enabler of their dreams. “5G is being talked about as part of the 4th Industrial revolution, allowing a raft of new and exciting products and services across a digital platform underpinned by a 5G network. Cellcard is at the forefront of delivering this for all of Cambodia, every city, every town and every province,” Mr Watson said. Mr Watson said last week in Shenzhen China, members of the Cellcard technical team accompanied by senior officials from the Ministry of Posts and Telecommunication (MPTC) successfully tested the 5G technology. “We conducted 5G tests in Shenzhen on Thursday last week. This was at the ZTE purpose-built R&D site. There we simulated on our 3.5G frequency – on the actual equipment that will be deployed here in Cambodia. The tests were a great success and the speeds we reached were truly impressive. “Although a short test, the speed we gained was an astonishing 1.5 Gigabits per second. This milestone is part of the Cellcard strategy of using the 4 and 5G networks to support the government’s vision of building one of Southeast Asia’s most advanced digital economies. “And finally last week during an operation review at Cellcard, the chairman instructed both the technical and commercial teams to start the journey in building and delivering Cambodia’s first and best 5G network,” he said. Sok Puthyvuth, secretary of state at the MPTC, congratulated and welcomed Cellcard for pushing another step further toward the 5G technology. He said the MPTC will provide the support to push ICT in Cambodia in a bid to transform the economy to a digital economy heading towards Industry Revolution 4.0. “The MPTC is pleased to see Cellcard bring technologies to help the development of the country and improve the lives of our citizens. At the end of the day it is what the technology can do to help improve people’s life whether it is in the health sector, e-government, education or e-commerce that matters. “We look forward to collaborate more closely with Cellcard and ZTE to bring the technology to Cambodia, especially the 5G system.